I have been roasting chicken legs quite frequently for our dinner and I like making side dishes for our roasts . Be it potatoes or greens, I will try my best to whip out something nice out of them for the both of us. 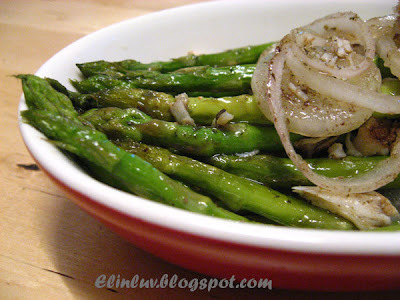 Asparagus is one of our favourite greens and instead of blanching them , I roasted them this time with onion rings and topped them with crab meat marinated with balsamic vinegar. This is a delicious side dish to go with our roasts. I always frequent the wet market for crab claws and will take out the meat for dishes like this :) The natural sweetness of the asparagus blends with the balsamic vinegar marinated crab meat. You can omit the crab meat if you do not have them in the fridge. Since I have some left in the fridge, I used them for toppings. 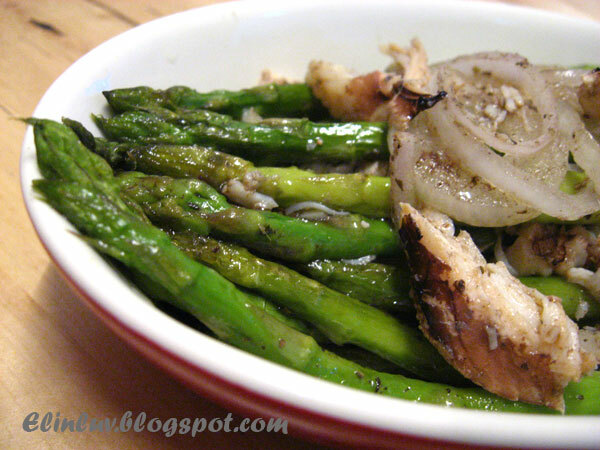 The roasted asparagus will taste just as good without the crab meat . 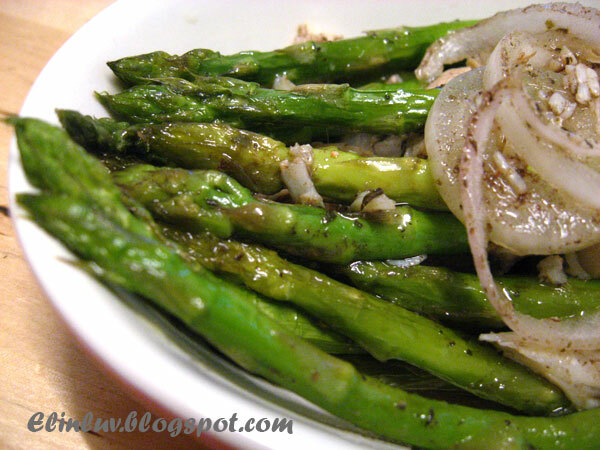 Pepped the roasted aspargus with a drizzle of balsamic vinegar and served them as a side dish for your roasts :) Simple...it takes just 20 minutes to prepare this side dish. 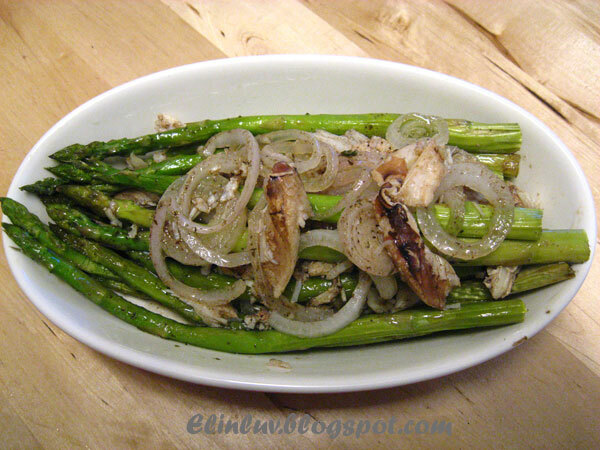 Ingredients required for this side dish are :- crab meat , asparagus , red onion ( cut into rings ) ground black pepper, olive oil , sea salt and balsamic vinegar . First, place a rack into the center of your oven and preheat it to 350°F. While the oven is warming up, wash the asparagus to remove any dirt particles that may be lodged in the tips or stuck to the stalks. Snap off the bottoms of the asparagus stalks. The bottom of the stalk is fibrous and not very pleasant to eat, so just grab the bottom and bend until it snaps. Let the stalk snap at a natural breaking point as close to the cut end as possible. So as to guarantee that all your asparagus stalks will be tender. Pour about 2 Tbs. olive oil onto a baking sheet. Using your hands, roll the asparagus and the cut onion rings through the oil and rub them against each other until the oil coats them all. 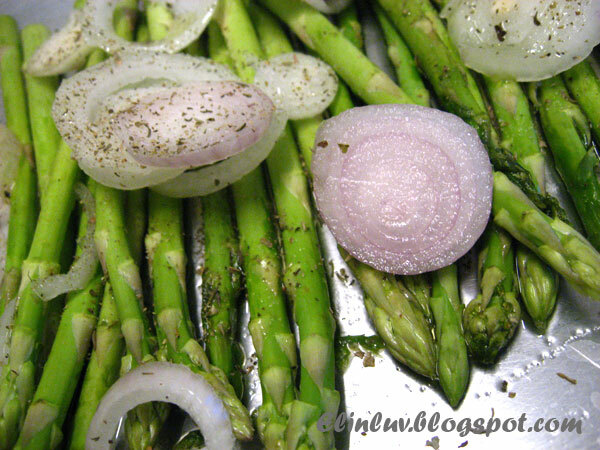 Spread the asparagus out in the sheet pan to form a single layer. Apply freshly ground black pepper and salt to the oiled asparagus. Place the onion rings and asparagus laden sheet pan into the oven and allow it to roast for 10 to 15 minutes. 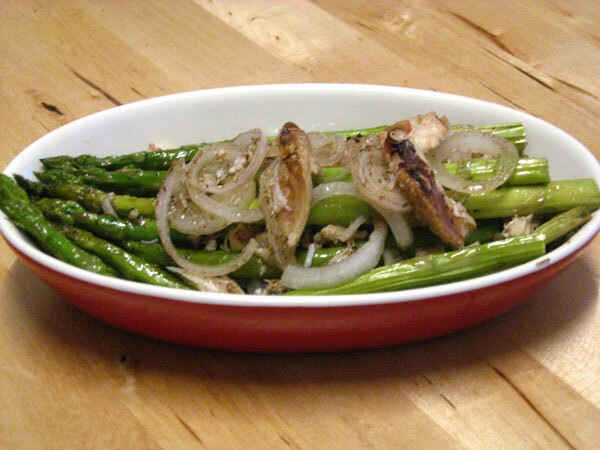 While the asparagus are in the oven baking , marinate the cooked crab meat with balsamic vinegar and leave to marinate for 10 minutes . 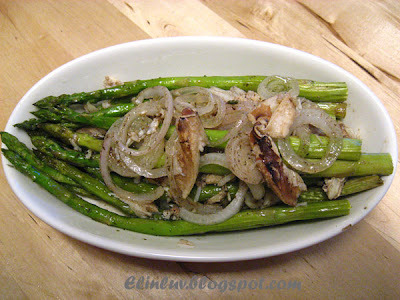 When the asparagus are ready, pour the crab meat over the roasted asparagus and served as side dish. This healthy vegetable side dish, topped balsamic vinegar marinated crab meat , is the perfect accompaniment to roasted meat or poultry. 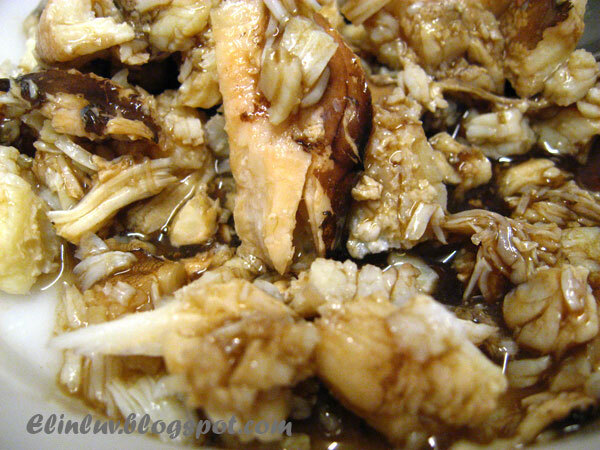 Come, lets go for lunch now.. makes me hungry looking at the crab meat! Have you tried deep fried asparagus wrapped in bacon? It is so delicious! Love the caramelized onion in the dish. This is a great recipe for next spring! I haven't seen asparagus in the grocery stores for a few months, but when I do, you can bet I am going to be looking for some crab, too! Very creative combination of flavors. Bet it tasted splendid! Anncoo...this is a lovly and delicious side dish :) Yup with lots of crab meat...mmm so delish ! Jason...yup it is delicious...the balsamic vinegar in the crab meat makes it more exciting in flavor !